Friday August 31, 2018 - President Uhuru Kenyatta organised a State dinner on Thursday evening in honour of visiting United Kingdom Prime Minister Theresa May. 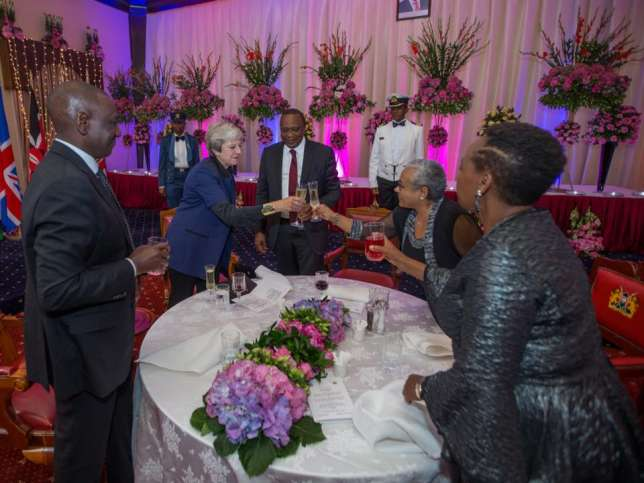 May, who arrived on Thursday for bilateral talks with President Uhuru Kenyatta, attended the dinner together with top UK Government officials. The dinner was at State House and was attended by Uhuru, his wife, Margaret Kenyatta, Deputy President William Ruto, his wife, Rachael Ruto, and National Super Alliance (NASA) leader, Raila Odinga. One photo that captured Uhuru, Maggie, May, DP Ruto and Mrs. Rachel Ruto toasting during the celebration was of interest to many. In the photo, President Kenyatta, his wife and PM May are seen holding glasses of champagne. However, curious Kenyans noticed that Mr. Ruto and his wife were not indulging in the alcoholic drink but toasted with their glasses of juice. The DP is a teetotaler who has been involved in leading various religious bodies. So what is wrong with toasting with mursik if that is what is my drink?! Hii uzungu utatuua. Kudos man Ruts and Mama Ruts! Keep it real! Unye kwnaza angewachotea hao ma odiero muratina kwa pembe ya ngombe! Ujinga mutaacha.